ThIs is a theme post of NBBN "AUTUMN"
I was really confused as what should i post about autumn....then i decide as Autumn is a festive season so lets post My favourite nine lippie for Autumn...why nine? 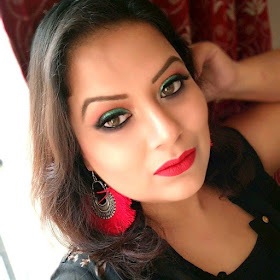 not ten?....well,i took nine lippie from my Navratri LOTD......!!! This is a picture heavy post as I believe Picture speaks a lot than words ! So Here is the Pictures of my favourite nine lippie...! Now Starting with Colorbar Lip gloss in coral craving. Here i applied it on my lips. This is Colorbar Take Me As I Am Lip color in Flirtatious Pink. Lakme Aqua shine In Shade Fig. Diana Of London 2000 Kisses In shade Berry Pink. Chambor Powder Matte Lipstick in shade Desert Rose. Chambor Powder Matte Lipstick In shade Coral Reef. Colorbar Soft Touch In shade Citrine. Colorbar Creme Touch In shade Passionate. Revlon Color burst In shade Peach. So these are my favourite nine lippie that i think is perfect for this Autumn :)And here comes to "The End " of my post. Till then Be happy and Keep Dazzling !